Colliers International and Thorburn Property have been appointed to lease the largest remaining available office tenancy on St Kilda Road. Colliers International’s Ben McKendry and Thorburn Property’s Kenny Thorburn have been appointed to lease 16,000sqm of refurbished space at 412 St Kilda Road. The 21-level, 16,285sqm office building comprises 14 levels of office accommodation in total and a seven level car park. It is being vacated by Victoria Police, who will relocate to new facilities on the corner of Spencer and Latrobe Street. Mr McKendry said 412 St Kilda Road, which dominated one of St Kilda Road’s most prominent corners, would be the most significant listing in the precinct in recent years. “This is the largest, most significant vacancy to hit the St Kilda Road market in the last five years, since NAB moved out of 509 St Kilda Road,” he said. “While the building has been touted for residential conversion in recent times, this is not a fait accompli. There is substantial demand for office space in this tightly held market and buildings with large floors and excellent views such as 412 St Kilda Road still offer many of the key draw cards that attract major occupiers. “A full building refurbishment has been proposed, with Gray Puksand engaged to put forward their thoughts on a complete facelift to cater to the needs of the modern office tenant. “A refurbishment will modernise the building and make it highly appealing to large occupiers in the market who currently have limited backfill options. A refurbishment will complement and enhance the existing appeal of the building, and will encompass both internal and external upgrades. The vacancy rate in the St Kilda Road office precinct currently sits at 9.77 per cent as at January 2015, down from 11 per cent at July 2014. It is expected to decrease further when new July 2015 figures are calculated. 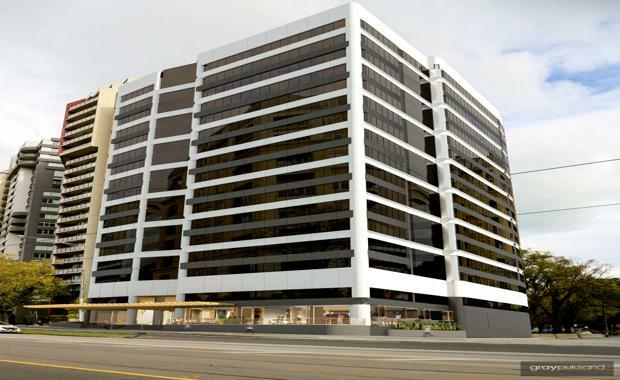 Mr Thorburn said the prime corner location, with three street frontages, within the prestigious northern precinct of St Kilda Road would make 412 St Kilda Road a popular addition to the precinct’s limited available office space. “It is directly opposite the Shrine and Botanical Gardens, providing spectacular views, and is situated in one of Melbourne’s best lifestyle precincts,” he said.